In a similar way to the minimalist house extension and writer’s retreat designed by architect Antonin Ziegler, this transformation project of an old barn into a contemporary living space features a distinctive fenestration and wide, open spaces. But the similarities largely end there. Unlike the simple, rectangular form of the extension, this new structure reproduces the look and feel of rural buildings, complete with their monolithic appearance, archetypal shape and minimal openings. 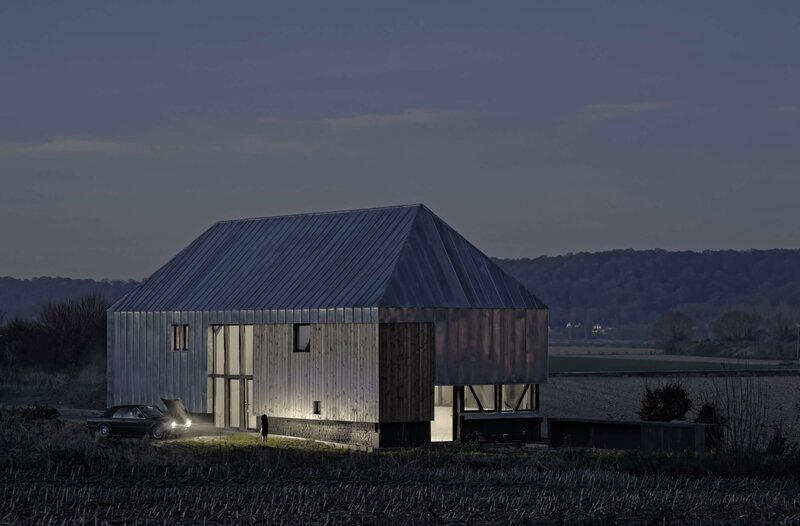 Built on the framework of the ruins of the old barn, the dwelling now boasts zinc cladding with an unfinished surface which will develop a patina over time and thus integrate further into the landscape. The striking exterior also features a natural stone foundation and parts of the original wooden framework running across the ground floor’s windows. The openings, seemingly cut into the metal panels, provide direct views over the surrounding fields and nearby river. “The windows and doors are visually understated: the archetypal house is kept at bay to give rise to another kind of habitat, more in keeping with the surrounding wilderness,” explains the architect. “A lone crack that pierces the roof and walls thus gives the project the appearance of a contemporary ruin,” he adds. Inside, the original wooden beams dominate the living spaces and becomes a fundamental element of the design. Concrete surfaces and tiles on one side and animal skins and warm wood on the other create a powerful contrast between modern and rustic. The ground level includes the socializing spaces – an open-plan living room and kitchen – as well as an indoor pool and master bedroom. Upstairs, in the place of the old hay loft, there are four bedrooms. Reborn from the ruins of the old structure, the new barn takes on its new role – of a sophisticated yet also rustic modern dwelling. Photography by David Boureau and Antonin Ziegler.